Lexus has unveiled, at the North America International Auto Show in Detroit, a remarkably powerful Lexus 5.0-liter V8 for awesome road and track performance which combines new coupe style with Lexus F feat. Lexus RC F is a fine car with maximum polishing and global first-use of Torque Vectoring Differential in front engine rear drive sports vehicle for nimble control and maximum performance. Most great Lexus V8 F is constructed with all-new 5.0-liter, 32 valve engine with cylinder head. For the maiden time, the RC F will employ Atkinson cycle at cruising speed for efficient fuel economy with a deft switch to Otto cycle to higher revolutions for impressive output. The Lexus 5.0-liter V8 is capable of generating over 450 horsepower and 520 pound-feet of torque through eight speed transmission and electronic Controlled automatic Transmission with intelligence (ECT-i). 2015 Lexus RC F has seating capacity of 4, plus four-wheel power assisted disc brakes (Brembo manufactured for Lexus) with Anti-lock Braking System (ABS) and Electronic Brake force Distribution (EBD), etc. The MPG for city/Hwy/Combined and its 0 – 60 sprints is noted to target better than IS F with a top speed of 270 km electronically limited. Its vectoring differential has Standard, Slalom and Track, all geared towards balance of sprightly steering response, stability and performance. The interior of Lexus RC F is cockpit-like with aggressive exterior which complements the beauty of its unique interior: steering wheel, seats, ornaments, etc. One remarkable thing about RC F is that it prioritises users’ comfort through its elliptical cross thick-grip steering wheel with max placement of paddle gear shifts plus all-new, high-back seats, embossed with an F on the headrests which is fashioned to resemble form-fitting athletic sportswear. Evidently obvious on its exterior is visual aggression depicting stylish figure of a new RC coupe with a Lexus signature spindle grille dominating the front with a subtle “F” motif embedded in the mesh below the Lexus symbol. 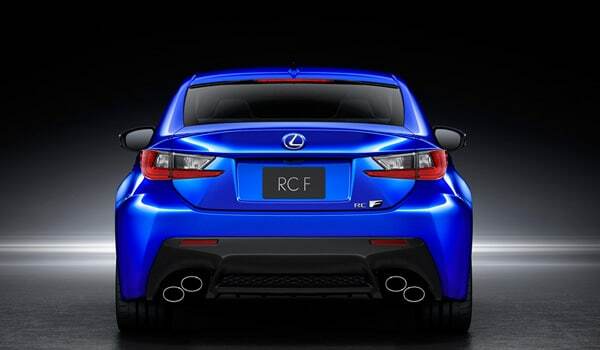 The new Lexus RC F will be facing serious competition from Audi RS5 as one of its primary contenders.